Wall Street Journal reveals the United States intercepted Netanyahu's calls in order to monitor his campaign against the Iran deal. President Barack Obama’s administration continued to spy after Prime Minister Binyamin Netanyahu, even after he announced two years ago he would curtail the National Security Agency’s eavesdropping program on friendly heads of state, The Wall Street Journal reported Tuesday. Current and former officials who spoke to the newspaper said that the White House decided to keep certain allies under close watch and that Netanyahu topped the list. The U.S., pursuing a nuclear arms agreement with Iran at the time, captured communications between Netanyahu and his aides that inflamed mistrust between the two countries and planted a political minefield at home when Netanyahu later took his campaign against the deal to Capitol Hill, according to The Wall Street Journal. The National Security Agency’s targeting of Israeli leaders and officials also swept up the contents of some of their private conversations with U.S. lawmakers and American-Jewish groups, the report said. That raised fears, an “Oh-s**t moment,” one senior official said, that the executive branch would be accused of spying on Congress. Over the past few years there has been a series of revelations related to the NSA’s spying program, most of which has been based on documents supplied by former NSA contractor Edward Snowden. Snowden’s leaks revealed, among other things, that the NSA had monitored the phone conversations of 35 world leaders. The documents particularly caused tensions with Germany, after Chancellor Angela Merkel phoned President Barack Obama and accused the NSA of monitoring her telephone conversations. As for the spying on Netanyahu, White House officials believed the intercepted information could be valuable to counter Netanyahu’s campaign against the Iran deal. They also recognized that asking for it was politically risky, however, so, wary of a paper trail stemming from a request, the White House let the NSA decide what to share and what to withhold, officials said. Stepped-up NSA eavesdropping revealed to the White House how Netanyahu and his advisers had leaked details of the U.S.-Iran negotiations to undermine the talks; coordinated talking points with Jewish-American groups against the deal; and asked undecided lawmakers what it would take to win their votes, according to current and former officials familiar with the intercepts. Mostly disturbing is the fact that after Snowden’s revelations and a White House review, Obama announced in a January 2014 speech he would curb such eavesdropping, and this surveillance of Netanyahu came after that announcement. According to The Wall Street Journal, in closed-door debate, the Obama administration weighed which allied leaders belonged on a so-called protected list, shielding them from NSA snooping. French President Francois Hollande, German Chancellor Angela Merkel and other North Atlantic Treaty Organization leaders made the list, but the administration permitted the NSA to target the leaders’ top advisers, current and former U.S. officials said. Other allies were excluded from the protected list, including Recep Tayyip Erdogan, president of NATO ally Turkey, which allowed the NSA to spy on their communications at the discretion of top officials, according to the American officials who spoke to the newspaper. 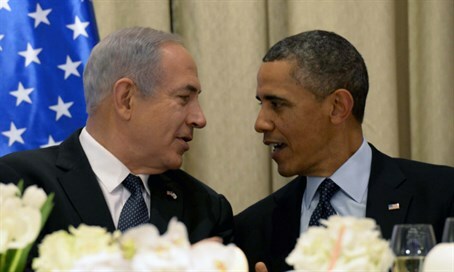 Privately, Obama maintained the monitoring of Netanyahu on the grounds that it served a “compelling national security purpose,” according to current and former U.S. officials. Obama mentioned the exception in his speech but kept secret the leaders it would apply to. The Wall Street Journal noted that its account, stretching over two terms of the Obama administration, is based on interviews with more than two dozen current and former. intelligence and administration officials and reveals for the first time the extent of American spying on the Israeli prime minister. The report also marks the second time that American surveillance on Israeli leaders has been exposed. Some Snowden documents showed that the U.S. had been monitoring the email traffic of Israeli officials, including former Prime Minister Ehud Olmert and former Defense Minister Ehud Barak.